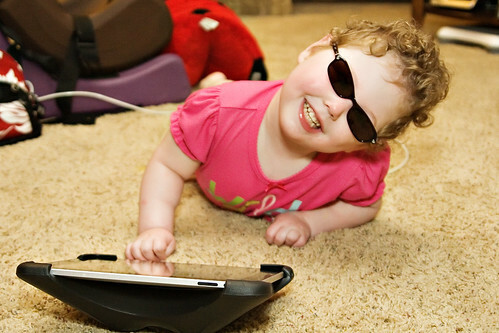 Caleigh got her new sunglasses this week. We had been debating on getting her a whole new pair of shades or just replacing her current stylin' duds with transitions lenses. The new sunglasses won mainly because of the time it takes for the transitions to, well, transition. So Caleigh is the proud owner of a her very own Disney Princess purple frames with little hearts on them, sunglasses. She was so excited at the eye glass place. She was babbling up a storm and smiling like crazy. She loves them. We now have Caleigh's feeds up to 55ml an hour. This allows her to be off of her tube feed for 4 hours a day. I think we will hold steady at this rate while we are trying to wean her off of the sulfasalazine (ulcer med). 4 hours a day is very liberating. This new milestone only took a month to achieve. Caleigh still isn't eating anything by mouth. I really don't have an interest in trying right now either. Caleigh does enjoy suckers. I found these organic, free of of anything that might be an allergy, suckers, at Whole Foods. She loves them. Her favorites so far are pomegranate and sour apple. She tends to lean towards the more bold flavors. She isn't a fan of the sweet watermelon. Caleigh even requests these suckers on her iPad. So I know that she likes them. There is some oral motor stuff going on daily, but other than that I'm too exhausted to even try foods. Things are going too well to rock the boat. Last week Caleigh was having really strong dystonic movements. I talked to the neurologist and we decided to wait and see if they got better before adjusting the Artane dose. I'm told that getting vaccines can cause an onset of stronger movements and being sick can do the same. Caleigh had a bout with allergies a few weeks back and we switched up her allergy meds. She also had the flu shot. So wait we did. On Saturday, I went to put Caleigh in her walker and I had to adjust it. Then I had to adjust her wheelchair, and then her stander. Apparently, what we were dealing with was a growth spurt. Her movements are a little stronger than usual but they are getting better. We decided to keep the Artane the same and actually went up on it last night. We have 1 week until Caleigh's powerchair arrives. Just in time for Caleigh's acceptance of wheelchair living we go and switch things up. I'm hoping the transition is smooth and well accepted.